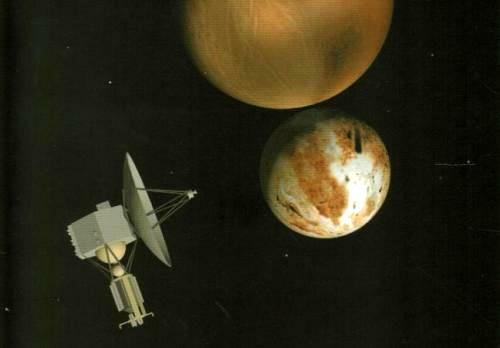 Postcard DE-4851768 from Germany shows Pluto and its moon Charon. 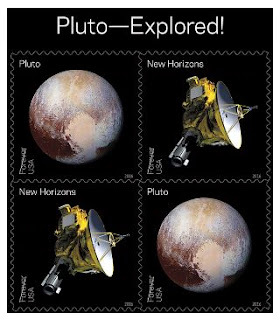 USPS announces that it will issue the Pluto – Explored! Forever stamps at the Jacob Javits Center in New York City, New York on May 31, 2016 during the World Stamp Show – NY 2016, in order to recognize the NASA's history-making first reconnaissance of Pluto: New Horizons mission in 2015. The souvenir sheet contains four stamps in two designs. The first design shows an illustration of the New Horizons spacecraft, while the second design shows a striking image of Pluto taken by the spacecraft near its closest approach. The image is a composite of four photos from the Long Range Reconnaissance Imager, combined with data from the sensor Ralph.